In the hey day of Hong Kong cinema, that is, the early 1990s, one would be surprised to hear that a decade later, Johnnie To, would be the most industrious director working in the territory and the most acclaimed after Wong Kar-Wai. Not that To had anything to be ashamed of in his early career. 1993’s The Heroic Trio remains an invigorating pop art extravaganza and his best film to date, but he had sturdy competition in the form of John Woo, Tsui Hark, and Ringo Lam, all of whose careers are now wisps of their former glory. With the creation of his own film company, Milky Way Image, in 1996, To has turned to more serious works typically dealing with cops, gangsters, and hit men, and his films have been popular as well as garnering acclaim from critics. He’s been a film festival regular with the likes of The Mission and PTU. His focus on drama has been more than a bit stifling however, and his latest, Triad Election, is no exception. Triad Election, or Election 2 as it was released in Asia, is the sequel to Election, about the power struggle for chairmanship of the Wo Sing triad. One does not need to see the prequel to understand the narrative here as the prequel only helps round out some of the characters. The position carries a mere 2-year term limit and the next election is nigh. 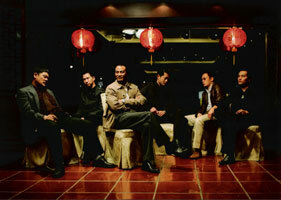 Current chair, Lok (Simon Yam, Bullet in the Head), has ambitions to stay where he is and defy the triad elders but also faces competition from his godsons. Apparently he has nothing to fear from the popular handsome entrepreneur, Jimmy (Louis Koo, Zu Warriors). Jimmy is the triad’s number one money maker by dealing in pirated discs, but he wants to go legit and start a family with his beautiful wife (Kelly Lin, Fulltime Killer). He is making big business deals with mainland China and despite the pressure from triad elder, Uncle Teng (Wong Tin-Lam, The Longest Nite), Jimmy refuses to pursue the chairmanship. That doesn’t last long however. When Jimmy gets arrested on the mainland, it jeopardizes his legitimate deals. The corrupt mainland officials are only willing to deal with him if he attains a higher position of power, namely chairmanship. Cool and calculating, Jimmy’s quickly overcomes his reluctance for the reins of power and immerses himself in the ghoulish activites that will lead him to his goal. If the movie presents the audience with a rooting interest in the beginning, that compact is highly compromised by the end. Let’s just say Michael Corleone never had to engage in corporeal gruesomeness to this extent. Triad Election is competent on every level. Koo has the intensity of a young Tony Leung and is every bit as icy as Al Pacino in his similar role in The Godfather movies. Director of photography Cheung Siu Keung makes much of the film live in a pervasive darkness, and in light, it breathes in chilling hues of gray and blue, both fitting of the depraved subject matter. Still, Triad Election lacks the emotional punch or aesthetic dazzle to take it up a notch. It may be unfair to compare it to the crazy energy of yesteryear’s Hong Kong cinema, but it doesn’t match up well with the best American gangster films either. To has fashioned an intriguing tale in which his aspiring protagonist discovers that the final destination arrived between legalized greed and the illegal sort may not be all that different, but the impact of that realization doesn’t resonate strong enough.